Please click on the Gold links for more pages and pictures. Classmates and guests were greeted by Linda Enwell, Ray Listermann and Rick Weinmann in the hallway. 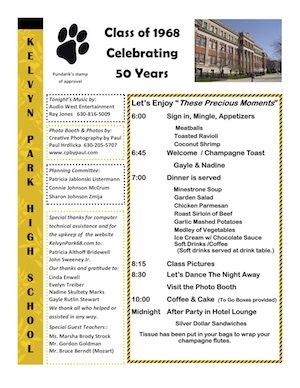 Each attendee, eighty-three including 2 teachers, received a name tag, drink ticket, Panther bag, notebook, pen, glass cleaner, newsletter and a plastic photo strip holder as they entered the decorated hall in honor of our 50th reunion. The hall was decorated with black and gold throughout. Each table had a black and gold balloon, a yearbook picture candle centerpiece, a table sign and black and gold candy. One table was dedicated to our classmates who are no longer with us. Memories of them brought back by pictures and flags with each of their names on them. Another set of tables held memorabilia set up by the committee and some brought in by our fellow classmates. The memorabilia table held pictures, yearbooks, sweaters, a beanie, pins, just to name a few of the items available to ponder over. Everyone seemed to enjoy looking over all the things that brought back those good ol' KP memories. Guests were able to check out all the decorated tables, mingle, trying to figure out who everybody was and enjoy appetizers of meatballs, toasted ravioli and coconut shrimp. At 6:40 pm, guests were asked to be seated and light their table candle to officially start our reunion. Champagne and Cabernet wine were at each table and guests were asked to fill their KP champagne flutes to make a toast. At this time Nadine Skultety Marks and Gayle Rutlin Stewart were asked to give our “50th Welcome”. 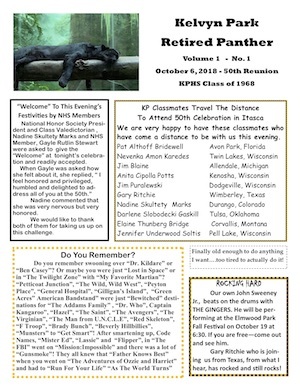 Four years down “KP Memory Lane” were reminisced as classmates were reminded of gunny sack swimsuits, no swimsuits at all, team wins, team losses, Globetrotter benefit games, ROTC awards and even the fact that there were no girl teams back then! After Nadine and Gayle finished their reminiscing, they made a toast to all for good health and to gathering for the celebration of our 50th. Ms. Marsha Brody Strock then thanked us for inviting her to the reunion and that she was happy to be a part of our high school years. After she was finished, the committee presented Ms. Strock “Brody” and Mr. Goldman with engraved glass mugs. As dinner was being served, there were a few presentations made for anyone who served in the Armed Forces, Educators, First Responders, Alumni, Medical Field, those married for 45 years and a few individual ones for funny or interesting stories. Dinner included minestrone soup, garden salad, chicken parmesan, roast sirloin of beef, garlic mashed potatoes, sautéed vegetables and was finished off by vanilla ice cream with chocolate sauce. Paul Hrdlicka, our evening’s photographer, was busy taking photos before dinner, during dinner and then started to take school group photos after dinner. Hoping that all group photos got taken, the dance floor opened and photo booth pictures began. Ray Jones dazzled us with hits from the 60’s and tried to keep that dance floor busy! Our KP Panther decorated whip cream cake was cut and served with coffee at 10 pm and it seemed as if we still almost had a full house. There were still people on the dance floor, photos being taken at the photo booth, small groups gathered talking and people sitting at tables enjoying their cake and coffee. As the evening moved along, the crowd very slowly dwindled. Small silver dollar sandwiches were served at about 11:30 pm and when the reunion closed in the hall a small group continued for a while in the hotel bar. It seemed as a good time was had by all! Click on LINKS for pictures. Thanks to Pat Jablonski-Listermann for the narrative. Click on pictures below to download .pdf files. Our FaceBook group requires you to be added by somebody already in the group. If you are on Facebook and would like an invitation, please use the "Contact Us" link at the left to let us know so we can get you added.